If you live in an urban (or suburban) environment, birds tend to make up a large percentage of the wild animals that you encounter in your daily life and in some cases may need to be removed from your home! From tiny sparrows to majestic hawks, humans are typically fascinated by birds, unless they have found their way into your home or business. However, there’s a very distinct difference between hearing a bird chirping, singing, or flapping its wings outdoors and hearing a bird singing, chirping, or flapping its wings inside your home. One is natural and normal, and the other is cause for alarm! Wild birds may be pretty to look at, but close encounters with these creatures get very ugly very quickly. Bird feces can transmit histoplasmosis, cryptococcosis, salmonella, and other potentially fatal diseases to humans. Mites and ticks like to lurk in the feathers of wild birds; once their host gets into your house, there’s nothing stopping them from targeting your pets or family members. And then there’s the issue of damage to your property: when birds aren’t leaving extremely caustic droppings everywhere and weakening man-made structures, they’re building nests inside your chimney and creating a serious fire hazard. Wild birds who decide to move into your home should be made to “fly the coop” immediately. But getting them to leave is definitely a job best left to a professional! Large flocks of birds congregating on your property, especially on your roof or in nearby trees. Bird feces or stray feathers in your fireplace or attic. You may also notice a higher-than-usual amount of bird droppings on your exterior walls, roof, backyard deck, and porch. Scratching, rustling, or chirping noises coming from your attic, roof, or chimney. A foul odor permeating your home that can’t be traced to a specific source. Damage to your home’s roof (especially the eaves) and gutters. Blockages in your gutters or vents. Piles of nesting material (including grass, twigs, leaves, and even garbage) somewhere on your property. Birds don’t need much in order to enter your attic or walls. More often than not, a small hole in the roof or brickwork will suffice. Vents are easy access points, as well, and uncapped chimneys are practically irresistible. Don’t assume that, just because you always keep your windows and doors shut, you’ll never have to deal with a bird infestation. These flying pests are smart enough to improvise! Yes. 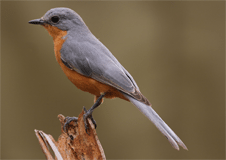 Many bird species in the United States are protected by the Migratory Bird Treaty Act of 1918. This piece of legislation makes it illegal to hunt, capture, injure, remove, or relocate any migratory bird, and that includes their nests and eggs. If you wind up with a migratory bird on your property, you are legally required to wait for the bird to leave on its own, regardless of how annoying or inconvenient it may be to do so. Chimney swifts are notorious for (1) loving to build their nests in the chimneys of human homes and (2) having the legal right to do so. “I found a baby bird on the ground. I’d like to put it back in the nest, but I’m worried that if I handle the baby, I’ll get my scent on it, and the mother bird will reject it because it smells strange. What should I do? Go ahead and put the baby bird back in the nest. The idea that mother birds will reject chicks that have been touched by human hands is just an old wives’ tale. While you should generally leave wild bird handling to the experts, in this case, it’s okay to—literally—take matters into your own hands. Regularly inspect the exterior of your home (including the roof and windows) and other outdoor structures for holes. If you find one, either plug it with steel wool or patch it with proper building materials. Make sure that your outdoor trashcans have tight, secure lids. Have a cap installed on your chimney. Consider investing in specially designed bird deterrents, like decoys, bird tape, netting, and bird spikes. For bird removal in the Dallas, Fort Worth, and Houston areas, look no further than Chimney and Wildlife Specialists. We’re a BBB-accredited, award-winning company that utilizes humane, safe, and cutting-edge techniques to help homeowners get rid of pests. All of our specialists are certified, insured, and well-trained, so even the toughest jobs can be done quickly, efficiently, and affordably. We’re locally owned and operated, and in many cases, we offer same-day, emergency animal control services. If badly behaved birds are making a mess of your home or property, then don’t delay—contact Chimney and Wildlife Specialists today!